John Henigin and Frank Selby are getting ready for our trip to Alaska at the end of July. We're staying at Salmon Falls Resort. Contact John for all the details: [email protected]. Our first guest is Matt Herod. Matt is the General Manager of Salmon Falls Resort. 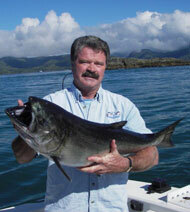 He gives us some great information about Ketchikan, AK and Salmon Falls. Sure hope you can join us on our trip. Here's the Salmon Falls web site: https://www.salmonfallsresort.com. Next we check in with Loren Williams out of Grand Junction, CO. Loren runs Mesa Outfitters, LLC. They specialize in elk, bear, and mule deer hunting, but offer high country trail riding and fly-fishing trips as well. Loren describes what a typical pack trip would be like. Go to https://www.mesa-outfitters.com. We're able to track down our buddy Bob Jacklin in West Yellowstone, WY. Bob has been serving West Yellowstone fishermen for over forty years out of Jacklin's Fly Shop. He's a world class fly fisherman, fly caster, and fly tier. Plus, Bob has a book coming out about the history of West Yellowstone. Check out http://jacklinsflyshop.com. Our final guest is Steve Lynch with Pro-Cure Bait Scents. Pro-Cure makes 47 different scents and they all work. Great web site at https://www.pro-cure.com. src="https://www.dropbox.com/s/ds28paujh65kknv/2019-04-13-FT-HOUR-ONE.MP3?dl=1">Your browser does not support the audio element.